I have nothing to apologize for. I am who I am and you should love me as such. I think I have some good qualities for anyone to even, give me a break when I need one. I generally try to be a good person. I generally like to think that I let people cut me off in traffic when it looks like they are more rushed than me. I don’t mind when folks are in line and take a little longer because they just look haggard. What I tend to accept in life is people being “inconsiderate” when it looks like they may have a reason. Sometimes though, we have to remember people are fighting battles underneath an armor of make up, perfect outfits and polished high heels. We have to remember the battles we all come to put on brave faces for and don’t let others know about. Perhaps it’s because we’re too proud, too weak, too strong, or hell, just too tired. I try and remember that. 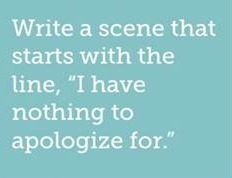 I try to not make too many people apologize for too much. Then at other times, I feel fed up and want the whole world (no one in particular) to apologize to me for piling all of the stresses on me at once. Then, if possible, to produce a time machine so I can go back and not only reset some things, but perhaps have reacted with the dignity that I try and practice – but don’t always – in moments of a less than elegant nature. I wish I could dial up the words and demeanor sometimes, but I cannot always – as I am human. I am not apologizing for that. So. Be human. Make mistakes. Be my friend. When you’re in my world, you have the opportunity to fall down, trip up, and everything in between. You are loved, and accepted, no.matter.what. I hope that I get the same freedoms. What would happen if you wrote for 10 minutes a day? Writing would be part of your life, the way you’ve always wanted it to be. It would be like brushing your teeth or making a pot of tea in the morning. A simple ritual. A habit. By the end of just a few months, you’d have a notebook full of raw material. You’d feel calm. You’d feel ready. Because you’re doing what you love: writing.